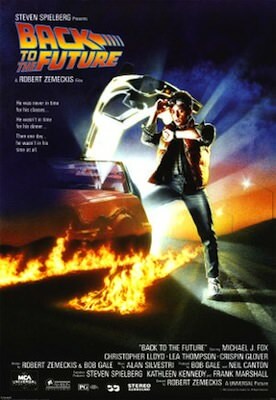 We all remember the scene in Back To The Future II where Marty McFly puts on these shoes that lace up automatically. And now you can have those shoes only they don’t lace up automatically but they do light up. These special Back To The Future shoes are just as amazing to wear and would work for so many occasions and they come with a power cable to charge up the LED lights. Even the box for these shoes is special with the Back The Future 2 logo on it. 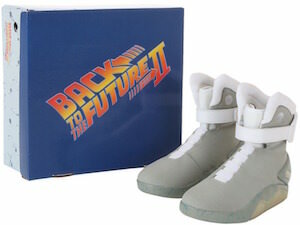 You can get these Marty McFly shoes in size 5 – 15 so I am pretty sure you can find you size. Why not dress up like Marty McFly with this amazing t-shirt that makes you look just like Marty did when he traveled in time. 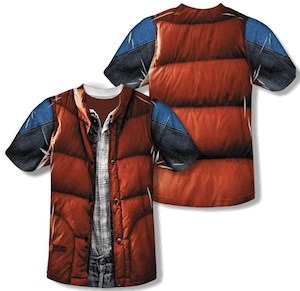 This sublimation t-shirt shows the costume back and front just like we know Marty with his famous puffy jacket. And this t-shirt is great for any day of the year but it’s also great as a Halloween costume as all you need are some jeans and you are set. This Back to the Future t-shirt comes in many adult sizes from Small – 3XL. Now could be the time to travel in time when wearing this Back To The Future Marty McFly Costume T-Shirt. Back to the Future fans will love this t-shirt. 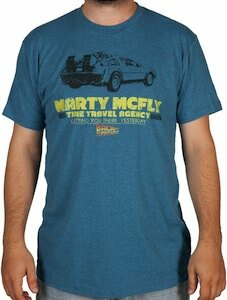 Of course this t-shirt shows the time travel car the DeLorean and below that it says “Marty Mcfly Time Travel agency getting you there yesterday” and it even has the Back to the Future logo. This t-shirt is a great memory of that famous Back to the Future movie series that we all loved and watch over and over. And now you can have this t-shirt to prove that you like Back to the Future. You can get this Back to the Future t-shirt in sizes Small – 2XL. So time to travel in time with this Back To The Future Marty McFly Time Travel Agency T-Shirt. 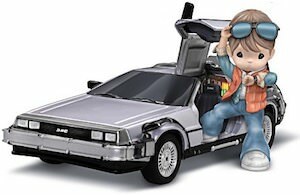 OK, you may not be able to get a delorean and travel through time …. 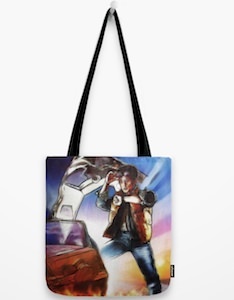 but one thing you can get is the really cool Marty McFly vest that did travel through time inside of a delorean. This vest is just like the one that Michael J. Fox wears in the cool movie Back To The Future, it is orange with big silver buttons and will definetley be a hit every time you put it on. Find your very own time traveling vest in a huge variety of sizes, and support the time traveling delorean and the movie Back To The Future. 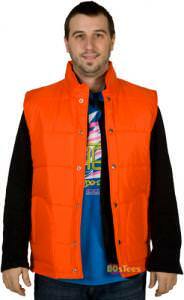 Check out the Back To The Future Marty McFly Vest. 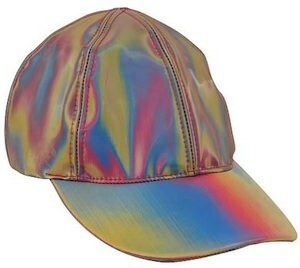 Marty McFly wore this cool hat in the Back to the Future movie and although this one does not change color automatically is still will make people look and think WOW I want one of those. This movie replica hat is a must have item for any movie collector. Not many people will dare to wear this hat but YOU do and that makes you stand out of the crowed. So wait no longer and go check out the Back to the Future Marty McFly Hat.